The Denver Nuggets went into Sunday’s game as winners of six-straight games after a 111-93 win over the New York Knicks on Friday that had six players score in double figures. Denver also woke up in first place in the Western Conference as the Dallas Mavericks beat the Golden State Warriors on Saturday evening paving the way for the Nuggets to control their own destiny for the final stretch. 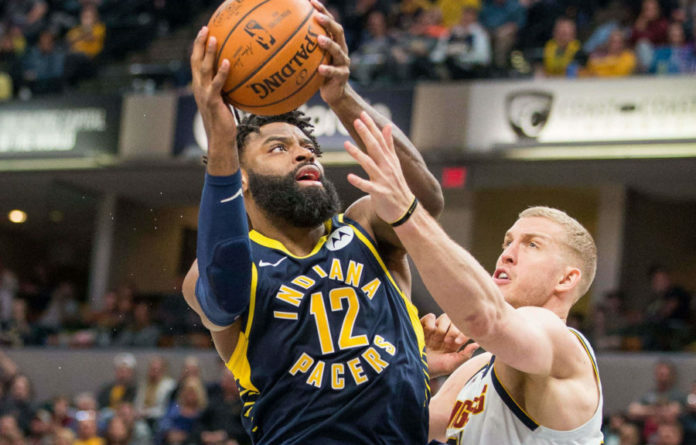 On Sunday, the Nuggets were up against an Indiana Pacers team that was seeking a bit of revenge after Denver beat Indiana on a game winner eight days ago by Paul Millsap to seal the victory at the Pepsi Center. In that game, Nikola Jokic was ejected and Denver dug deep to find a way to weather the storm. In Sunday’s game however, it was the Pacers who punched early and often as they completely annihilated the Nuggets. With a 124-111 victory by Pacers, Denver’s six-game winning streak has come to and end. With that, I give you the good, bad and ugly. One of the best parts of the game is that it is over. There were not many things to look at in this game and appreciate, but looking at the big picture of the road trip itself was a great thing. Denver clinched their first playoff spot in six seasons, won three out of the four games and will now head back home with a chance to take over the top spot with solid play down the home stretch. Denver was blitzed in this game and the Pacers put on a show from start to finish. They executed on offense, buckled down on defense and was able to change everything that the Nuggets went into the game and tried to do. In the midst of being on the wrong end of a blowout the bright spot in the game was Jokic. It was another game that Jokic got to rest for the fourth quarter but it was not without first scoring 19 points, eight assists and 11 rebounds. Will Barton also finished with 15 points in the game and Gary Harris had 11 while going back home, but other than that it was not a good showing for Denver. The Nuggets heads back to the Pepsi Center — where they have been at their best — to take on the Detroit Pistons on Tuesday. In Denver, they can get back in the swing of things and get back to the team that they have been all season long before going into their biggest stretch of the season where they will have to be at their best. While Denver was dominated from start to finish, the reason that they got into such a hole was because they came into the game out of rhythm. The first quarter was not the quarter that the Nuggets wanted as it was mixed bag results;, specifically from Jamal Murray. Murray had an up and down quarter as he finished with five early assists but also had three turnovers as well that led to Pacers baskets. Murray was dishing and getting others involved, but it is difficult to find any type of rhythm when your point guard is also turning the ball over for easy baskets on the other end. Nuggets trailed by four points heading into the second quarter as they allowed eight points off of turnovers. Indiana took that hot play into the second quarter where they upped their production and won the frame 23-35 to go into the half up 62-46. Indiana did not look back from there. The second quarter is where Indiana made their move and it was behind Bojan Bogdanovic who had everything going, he led all scorers with 26 points at the half and did not slow down on the night. Denver created such a hole in the first half as they allowed the Pacers to shoot 56 percent from the field that it was a bit too much for Denver to overcome and their first half was the main reason why their six-game winning streak came to an end. Denver did not have a good game on the road and that is exactly why they lost by 36 points. Denver looked dejected and had a very disappointing performance as the Pacers rallied. The Nuggets struggled scoring the ball, did not come up with stops and turned the ball over entirely too much and finished the game with 17 turnovers while allowing Bodganovic to finish with 35 points on the night. Denver has played well recently on the road but took a step back in Indiana only scoring 88 points. Denver will move back into second place in the Western conference with the loss as the Warriors beat the Pistons on Sunday. There are not many games remaining in the season and their hopes of being the first seed out West are dwindling. From here, Denver’s schedule does not get any easier. The Nuggets are coming off of a four-game road trip and only return to the Pepsi Center for one game against the Pistons, who are fighting for their playoff lives. From there they are up against the surging Houston Rockets, Oklahoma City Thunder and Washington Wizards. Hopefully, there is a better sense of urgency that what was seen on Sunday.